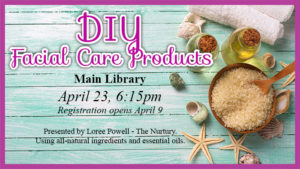 DIY Facial Care Products April 23, 6:15pm, Main Library Registration opens April 9 Presented by Loree Powell - The Nurtury. Using all-natural ingredients and essential oils. Walk to End Alzheimer’s is the world’s largest event to raise awareness and funds for Alzheimer’s care, support and research. Join us on Gloucester Main Street! Go to www.alz.org/walk to register as a team captain, team member, or an individual.